A friend and I, are undertaking the Chopra Center 21 day meditation challenge which begins today. 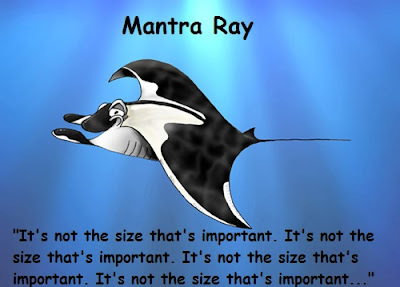 To her absolute horror and astonishment, losing all faith in mankind in the process, she discovered that there was no such thing on the internet (I confirmed this via Google myself) as a mantra ray. This is clearly a clever litte play on words, involving a manta ray and a mantra as used in meditation. To restore all sense and order to the universe, and to restore my friend's faith in humanity, which was so shockingly disturbed, I have remedied this situation, with my very own creation.